Here is the second cool book I have to show you this week. There's is a trend toward pre-cut fabrics as you all know. 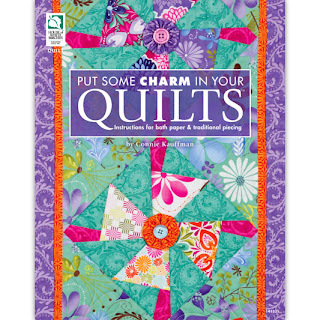 This book's designs call for charms and they work perfectly in these quilts. so I could make this...wow my list of quilts is growing. Leave a comment on this post to win a copy of "Put Some Charm in Your Quilts". p.s. don't forget to leave a comment for yesterday's book giveaway Bed runners and More. Hi I am really into making quilts with charm squares at the moment. This books looks lovely. Thanks for the chance to win it. Happy quilting. Since I can't seem to stop collecting charm packs, I think I could use this book! Thanks for the opportunity! I love working with charm packs. They are so versatile. The book would be a great help. I can always use a book that gives me ideas for 5" squares!!! Thanks for the chance to win!! Oh I would love a charm quilt book, I have so many, thanks so much for sharing! I love, love, love pre-cuts. This does look like a great book. Thanks for the chance to win. I love, love, love the quilt you picked out of the book! This looks like another great book! THanks for the chance to win! That looks like a great book! As a beginner, I need some ideas and information. Thank you for the opportunity. Wow...another great book. Count me in. The projects in this book look great. Thank you for the giveaway. I have several charm packs in my stash waiting for something to happen to them...maybe this book would get them going! Thanks for chance to win. 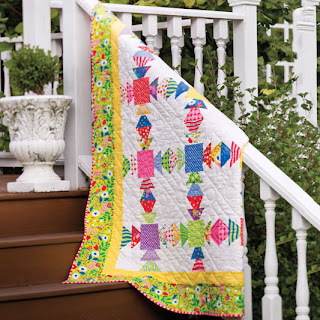 Love this book with the cheery quilts! I could get a lot of use out of it! I haven't tried any charm packs yet, but if that quilt on the stairway is an indication of what I'm missing, it's time I started! I love charm packs - and yes, my list of "want-to's" is growing too! I was cleaning my sewing room last night and I have a huge collection of charms that need to be used. This book looks exactly what I need! Thanks for the giveaway. I tend to buy charm packs as it's a cost effective (ie. Cheap!) way a to have a little bit of all those great fabric lines out there. Love to have some more ideas on what to do with them. i love charm squares and have several waiting for the perfect project! Well, I have used charm packs to make table toppers, placemats and coasters... this book might give me some fresh new ideas! Thanks for the chance!! Thanks for the chance to win this book. Looks like there are some wonderful projects. LOL - nice to know others are into the pre-cut assortments. I have been cutting charms from my leftovers as I have been bitten by the "Twister" bug. Your quilt is so bright - love it! This does look like a good one. Thanks for the chance to win. This book looks fabulous! I have some charm packs that I didn't know what to do with-thanks! Oh, this is a lovely book, would love to have it. Thanks for the chance..
i am new to quilting and love the precut fabrics available - thanks for the chance to win. I've never made anything with a charm pack and have one to use. Thanks for the chance to enter and win this book! This looks like a great book. Would like to win. Thanks for the chance. My comment didn't post! I've never sewn with a charm pack yet have acquired some. It would be wonderful to win a book that taught me how creatively use charms. Thanks for the chance. Oh gosh, I totally need this book. I have several charm packs I'm not sure what to do with at the moment. This book could give me the inspiration I need. How cute and with Terrain on the cover! Love it...thanks for a chance to win! Hi! This book would be great for my stash! I don't have any books specifically for charm packs so this would be great! This looks like a wonderful book, full of great ideas! Thanks. Thank you for the giveaway! I haven't seen this book before I'm loving the look of it! Charm squares are my favourite precut so winning this book would be a great way to use them. The quilt you have pictured is gorgeous. I love charm packs and buy them often but then I don't know what to do with them. This looks like a great book. Thanks for the chance to win. I have some of that Moda fabric also, looks like I should get that book so I can make that quilt! I could use some fresh ideas on how to use charm squares. Thanks for the giveaway. This book looks lovely. The little embellishments on the cover quilt and the design of the porch railing quilt are both beautiful. I know you aren't suppose to judge a book by it's cover but I love this one and would love to see that the rest of the book looks like! I love working with charm packs. The book looks great...thanks for sharing. I adore charm packs....little bundles of fabric goodness!! It looks like a cool book to use your scraps too!! thanks for the giveaway!! I have lots of charm packs but have trouble finding patterns that are cute (and don't look like they are a bunch of strips sewn together). These look great and I would love to try them. Thanks for the giveaway. Oh, what a nice book! I do love using charms, the pattern in the picture is so lovely! What a good idea...a book for using charm packs! Thanks for the opportunity to win.